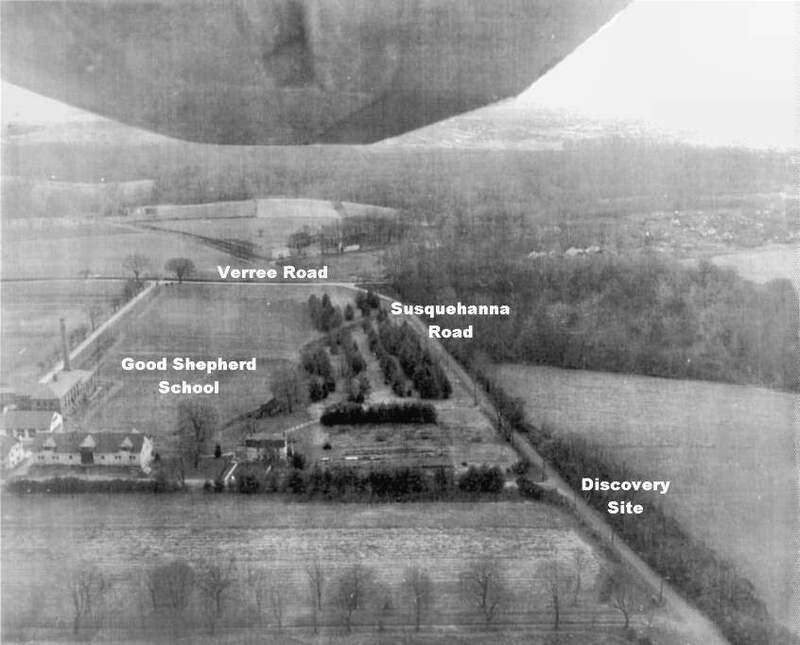 An aerial photo of the Susquehanna Road area taken in March 1957. East is at the top in this photograph. 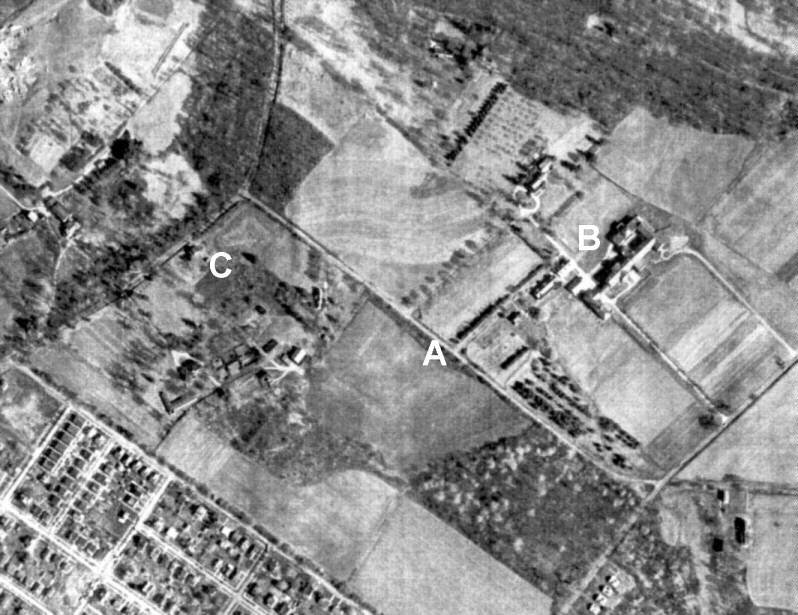 An aerial survey photo of the same area taken two years later (1959) for the Delaware Valley Regional Planning Commission. Susquehanna Road runs diagonally across the center of this photograph, linking Pine Road on the west with Verree Road on the east. The discovery site is indicated by the letter "A", the Good Shepherd School by the letter "B", and the Powroznik residence by the letter "C". 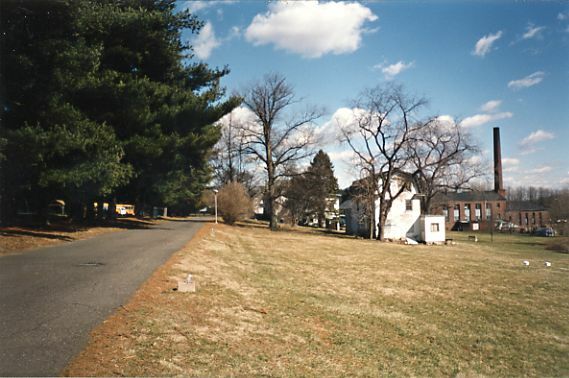 A view of Susquehanna Road looking east from a point approximately 35 yards west of the entrance to the Good Shepherd School. Only 15 feet in width, the road was too narrow for opposing vehicles to pass each other safely. The piles of discarded refuse near the right edge of the road mark the location of the discovery site. The same scene more than four decades later: February 28, 2000. 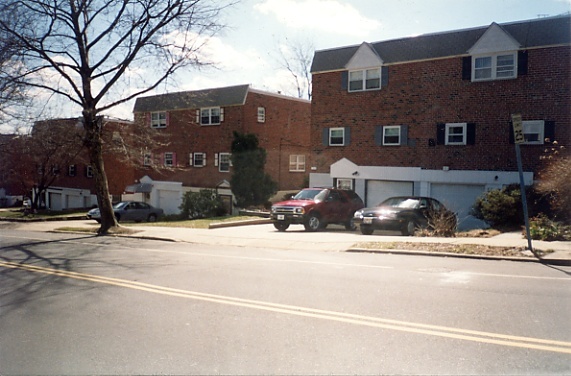 Susquehanna Road was significantly widened during the 1960's, and a housing development was built along its southern border. The original road did not extend as far as the double yellow line in this photograph. 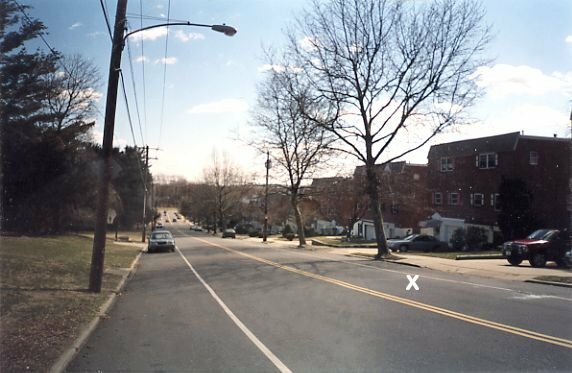 The spot where the unknown boy's body was found ("X"), is near the center of the eastbound traffic lane, almost directly opposite the utility pole. 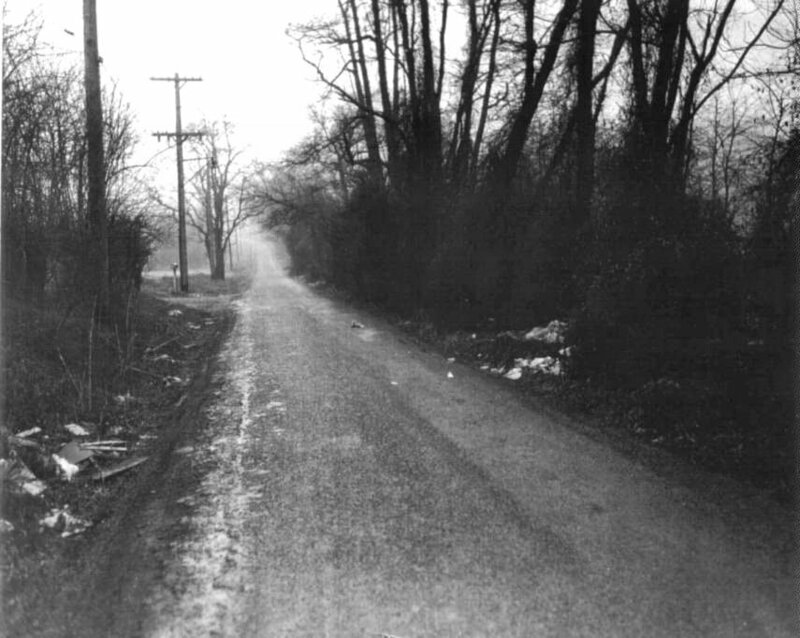 A photograph of Susquehanna Road looking west from a point near the Good Shepherd School driveway. The same scene more than four decades later: November 11, 2000. A view of the discovery site looking southeast from the roadway. 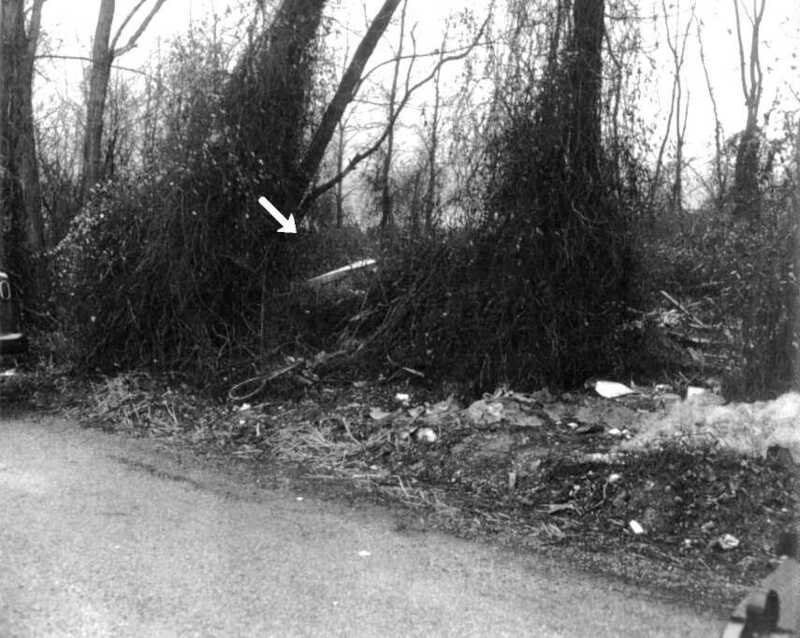 The cardboard box that contained the unknown boy's body (indicated by white arrow) was partially obscured by the dense underbrush. It was not readily noticed by passersby, and in any case, there was nothing remarkable about its appearance. There was certainly no reason for anyone to suspect that it might contain the body of a dead child. The same view more than four decades later: February 28, 2000. A closer view of the cardboard box. The open end is on the left. The unknown boy's bruised legs and feet. 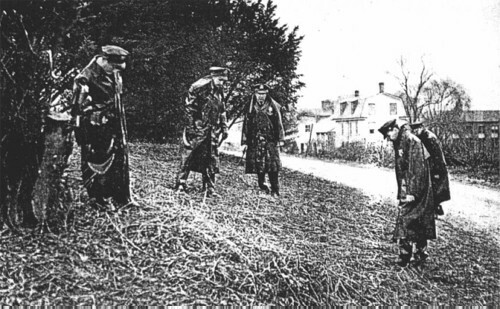 Philadelphia police officers examining an open area near the discovery site for clues. The police officer at the extreme left is Sam Weinstein, director of the Vidocq Society's Boy in the Box investigation team from 1998 to 2000. Standing next to him is Elmer Palmer, the first police officer to arrive at the scene. In the background, is the entrance driveway and some of the buildings belonging to the Sisters of the Good Shepherd. The same scene more than four decades later: February 28, 2000. Little has changed.